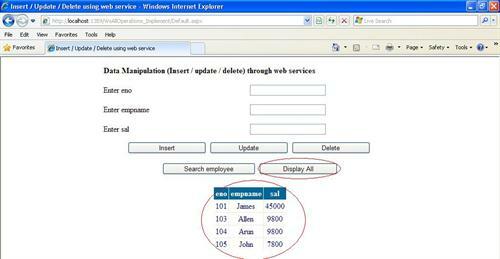 How to insert, update, delete and select operations through web service? In this article I am going to explain in detail about how to do insert, update, delete and select operation through web services. This code snippet is useful for other platform users also access your service to do all operation in your database. Mostly we are use web service for other platform user use able to access our site. For that reason I have cover most of all operations through web service here. First of all I have written SQL Helper class to access database. The new popup window appear in that window paste that URL box paste that URL and click go button to see preview of that web service and then click ok button to web service as reference of your new website. After add reference we are able to access web service class and its methods through our website code. In design side I have placed three textboxes, five buttons and grid view control to perform all operations through web services. &LT;asp:Button ID="btnSubmit" runat="server" Text="Insert" OnClick="btnSubmit_Click"
&LT;asp:Button ID="btnupdate" runat="server" Text="Update" Width="160"
&LT;asp:Button ID="btnDelete" runat="server" Text="Delete" Width="160"
&LT;asp:Button ID="btnRetrieveSelected" runat="server" Text="Retrieve entered employee"
&LT;asp:Button ID="btnRetrieve" runat="server" Text="Retrieve All" OnClick="btnRetrieve_Click"
In server side I have do all operation in each button click event I have call separate web service method to perform operation. First Import that reference and create instance for service class . 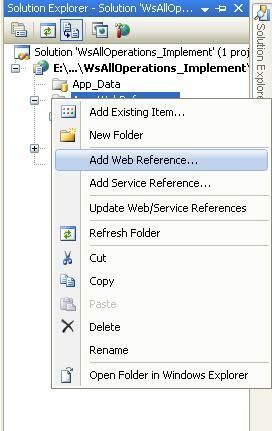 In this section I am insert new record to database through web service. First I create two instance for that insert class. One for request insert class and other one for response output class. I have assign each request class variable through that instance and call the web method InsertNewEmployee to insert new record into the database. In this section I am update existing record in database through web service. First I create two instance for that update class. One for request insert class and other one for response output class. I have assign value for each request class variable through that instance and call the web method UpdateEmployeeDetails to update record details in the database. 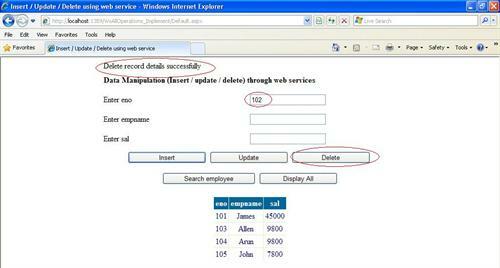 In this section I am delete existing record in database through web service. Same like above I have assign value for employee number mean which employee need to delete through that instance and call the web method DeleteEmployeeDetails to delete record from the database. In this section I am search single record from database using employee number and display output in the gridview. 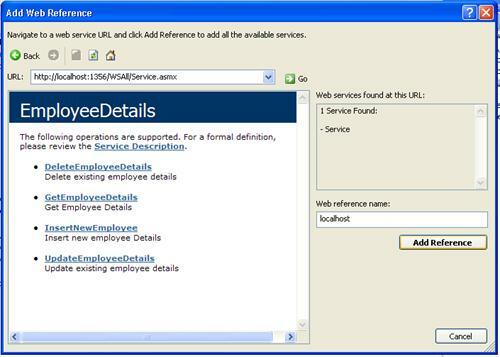 Here I have call that GetEmployeeDetails to search particular employee details from the database. In this section I am display all employee details in the gridview using below code I used same GetEmployeeDetails methods but I pass employee number as empty to display all records. I hope this code snippet is helping you to know how to do all operation through web services. 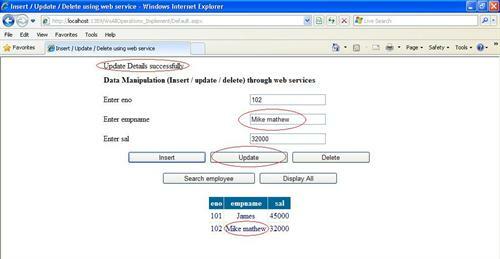 Follow below link which explains web service creation step by step.